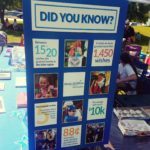 The Make a Wish Event, aka Rafting for Wishes, Fundraising Event is going on In Meredith in the Heskey Park near downtown and Lago. The event goes from Noon today to 6 pm tomorrow. 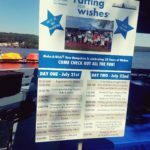 It has kids wanting their wish to be granted and is also celebrating 30 years of bringing wishes to life. There is rafting going on now and people are participating. There are a few tables including a Radio Station table. In addition, There is a singer singing, he sang great songs like Drift Away. He is talented and I have a video below. A stand has a 30 year anniversay of the Disney Store sponsored by the Disney Store in the Merrimack Outlet Mall. They are near their goal of raising $100,000. Nikki Lyons Lahey is one of the higher ups of the event, plus I know her. Come and join , its in a great location tooo on a nice day. Plus there is a lemonade stand. Here are pics below of this event. 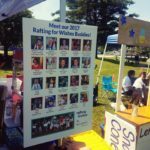 Pics Below What events are going in the Rafting for Wishes list the people, 2017 Rafting for Wishes Teams, the Rafting for Wishes Buddies (it says who they are with pictures of them), a stand that shows a poster of facts of wishes being granted and a Participant registration table. In addition the ones sponsoring the event have Make a Wish stickers that are shaped like Stars on their cars.